How to Connect your Android Device to a PC with a USB Cable. As well as connecting your Android device to Droid Transfer over your local WiFi network, you can also connect your Android device to your computer using a USB cable. Enabling Developer Options on your Android Device. You need to change some settings on your Android device so that "Developer Mode" is enabled. Open your device settings and choose "About phone", "About device" or just "About". Look for the entry "Build Number", or "Build Version". This entry may be under a further sub-menu called "Software Information" or "Software Info" on some devices. Your device will show you how many taps are required to enable Developer Mode. When done your device will have Developer Mode enabled. Go back to your main Settings menu - scroll down to the bottom, you should see a new entry called "Developer Options". Tap to open "Developer Options"
Make sure "Developer Options" is set to ON. Scroll down to "USB Debugging" and make sure that is enabled also. If it isn't, slide the toggle switch to the right to enable it. Depending on your Android device - a window may pop up on your phone asking you to verify that you want to enable USB Debugging. Click OK or Apply to allow USB Debugging to become enabled. Download Transfer Companion to your Android Device. Download Transfer Companion to your Android device from the Google Play Store. You need to be running at least version 1.58 of Transfer Companion - so check for updates if you have previously downloaded Transfer Companion to your Android device. 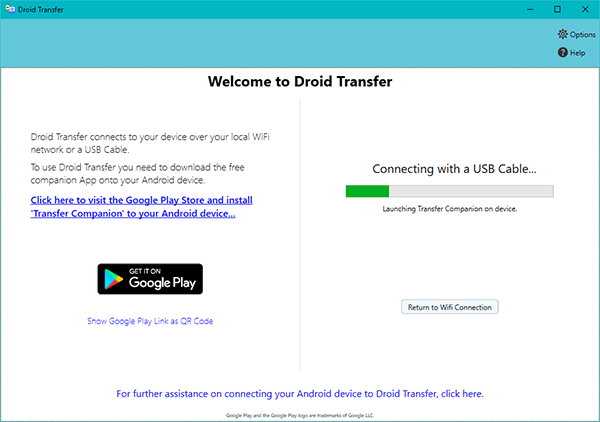 Download Droid Transfer to your PC. Connect your Android device to your PC with a USB cable. Depending on your device, your phone may request permission for it to communicate with your PC. Click OK or Allow on any prompts showing on your Android Device. 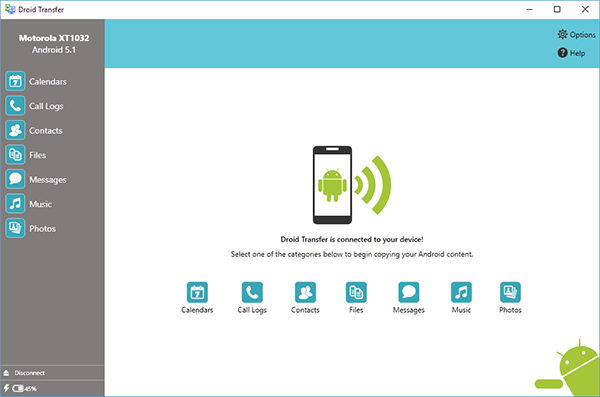 When Droid Transfer detects your device, it will launch Transfer Companion on your Android device and begin to load your phones data through the USB cable. 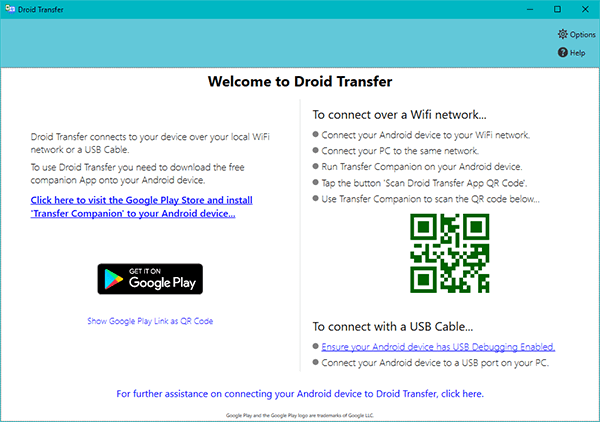 Connection is now made between Droid Transfer and Transfer Companion and you can start managing and copying your Android Phone content using Droid Transfer on your PC. If Droid Transfer is not able to connect to your Android phone via a USB cable - this might be a Windows Firewall configuration error. See this support article for details.